How Would You Show Both Versions Of The Gathering? View Poll Results: How Would You Show Both Versions Of The Gathering? Question for the group: How Would You Show Both Versions of The Gathering? 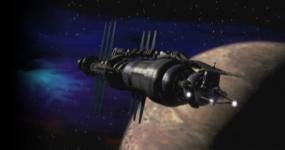 I am going to show Babylon 5 to a newbie. I am pretty sure he is going to become a fan. We are starting with The Gathering. I originally thought that I wanted to show him the Original Version followed immediately by the JMS or TNT Version, however you want to call it. I wanted to be sure he notices all the little differences between the two, like where certain lines of dialogue were changed and so on. Now that I have had too much time to think about it I am not sure I want to do it this way. So should I show him both versions of The Gathering at the same time or save the Re-Edit for later or show him the Re-Edit first? This is an important question because it will shape his expectations, especially if I were to show him the Re-Edit first then go back and show him the Original Cut down the road. Please vote and then tell me reasons why. THANKS! Tough question. I would say show the original version first followed by edit. Or you could show the edit after you are done with the series as a couple things here and there would make more sense. In the long run it probably doesn't matter a whole lot though. Yes you can see why I am debating. The problem with "In the long run" is the person I am viewing it with. He is very big into seeing things chronologically. He loves finding all of the little connecting details. (He recently discovered Hammer Horror films and LOVES them. He heard certain movies are connected and he has been trying to track all of them down to watch in order and find the connections despite my telling him that this effort might very well turn his mind into a Hammer Horror Film. ) I am going to take some serious heat for showing him IN THE BEGINNING much later on, so I don't know if I want to add a second movie to that list by showing him The Gathering Re-Edit much later on. As you know there are many discussions on how to show the series. I think if I explain all of that to him he will want to watch the series in the order recently posted by b5historyman. The question is how to fit The Gathering into that chronological order with the two different versions. They really are different when you really get in there, but I do believe they end at the same point. The message is the same even if different words were used to deliver it. Thanks for the early input Sinclair. That is annoying. Honestly, why not explain the situation to him, and ask him what he thinks he'd prefer? Yes that would make sense, were he normal. I have to tread very carefully you see. My main goal is preventing him from looking up any SPOILERS. If I start talking about viewing order and what is supposed to be where and so on I am worried he will go online and try to find out for himself to make sure I don't show it to him in an order he wouldn't approve of. This is important because I want him to love the show and I don't want him to know even the smallest detail in advance. I'd say show him the edited version first. Then let him watch the rest of the series before showing him the original version of "The Gathering." That is an interesting take and one that I assume most people will have. Kraig's approach does make sense. The kind of details the edited version will have are not essential to his understanding of anything, and it will avoid introducing subjects the he'd be able to google. I agree with this... I've only ever watched the edited version and never thought to look for the original, it's something that can be shown after the hook is firmly placed. It's also important to explain that it was the pilot and some things change. I've only ever lent my DVDs to 1 person and I told them to watch "In the Beginning" first though, just my preference. So I guess folks are not too interested in poll voting in these forums.